Para una versión en español, haga clic aquí. Para a versão em português, clique aqui. Miranda Elkins (left) worked on this with Rik Gran (right) while she was a master’s student at the University of Minnesota-Duluth. She is now a Ph.D. student at Iowa State University. 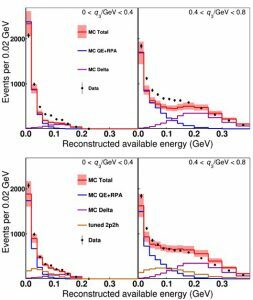 In order to appreciate why this new analysis of antineutrino interactions is exciting, you should know that over a year ago, MINERvA published a similar measurement with neutrino interactions producing negatively charged muons, where a proton is much more likely to be produced than a neutron. A proton’s energy is much easier to measure than a neutron’s in a detector such as MINERvA. 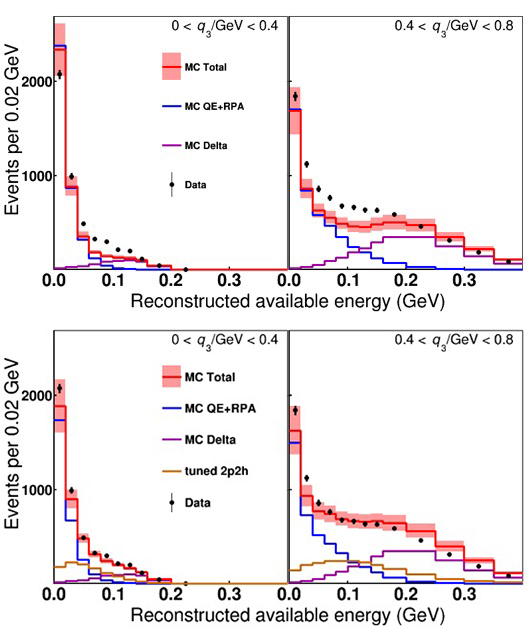 This analysis found that, for neutrino interactions on a proton-neutron pair (rather than on only one of those two particles), scientists observed a much larger number of events than the state-of-the-art models predicted. Neutrino cross section enthusiasts are never surprised when models don’t describe data. So here is the surprise: When they used the neutrino results to change the antineutrino model to predict the antineutrino data described above, it worked. You can see the improvement in the middle of the plots above. Those results were just released to the world this week, and you can watch the seminar where they were presented. 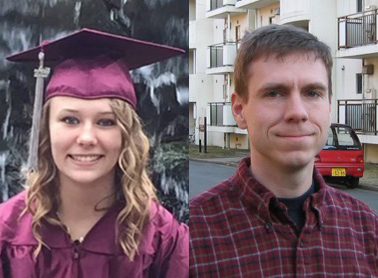 Miranda Elkins and Rik Gran, University of Minnesota-Duluth, were two of the scientists who analyzed this result.